Track voter preferences for Obama vs. Romney overall and by demographic group among registered voters. 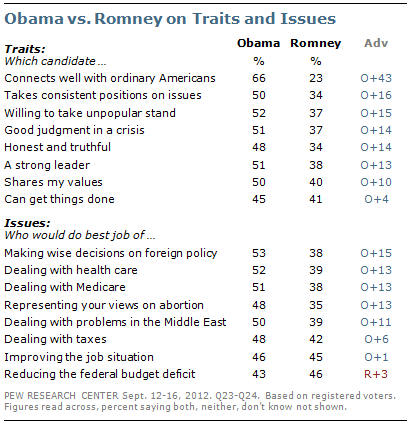 Not only does Obama enjoy a substantial lead in the horserace, he tops Romney on a number of key dimensions. His support is stronger than his rival’s, and is positive rather than negative. Mitt Romney’s backers are more ardent than they were pre-convention, but are still not as enthusiastic as Obama’s. Roughly half of Romney’s supporters say they are voting against Obama rather than for the Republican nominee. With the exception of Bill Clinton in 1992, candidates lacking mostly positive backing have lost in November. And the survey, conducted amid an outbreak of violence in the Middle East and shortly after the killing of the U.S. ambassador to Libya, shows that Obama has a wide edge when it comes to foreign affairs and national security. Far more voters see Obama as a strong leader and as the candidate voters believe would use good judgment in a crisis. Voters also express more confidence in Obama than Romney to deal with foreign policy generally, as well as problems in the Middle East. Obama also has a number of other advantages over his challenger. As has been the case for much of the past year, the Democratic Party is better regarded than the GOP by a significant margin; currently, 53% of voters view the Democratic Party favorably while 46% have a favorable opinion of the GOP. Michelle Obama remains extremely popular – 66% have a favorable opinion of the first lady. About as many voters (70%) view Bill Clinton favorably. 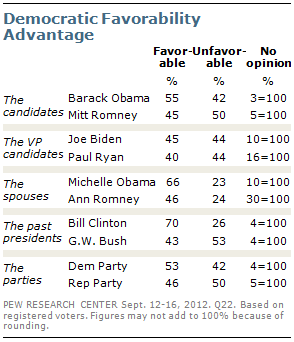 Joe Biden’s favorable ratings remain mixed, but that also is the case for Paul Ryan, Romney’s running mate. Both Biden and Ryan are among the least popular vice presidential candidates in recent history. The nation’s economic situation continues to be Romney’s best friend in this campaign. While trailing on most issues, he runs about even with Obama as the candidate best able to improve the job situation, and there is little indication that voters are feeling better about economy. Just 12% rate national economic conditions as excellent or good. Just 25% say the economy is recovering, while a 46% plurality still thinks it will be a long time before it recovers. Despite these gloomy opinions, the economy has not turned into a clear advantage for Romney. 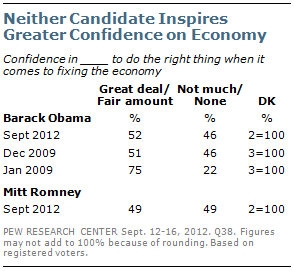 Almost the same number express confidence in Obama to do the right thing when it comes to fixing the economy (52%); as say the same about Romney (49%). 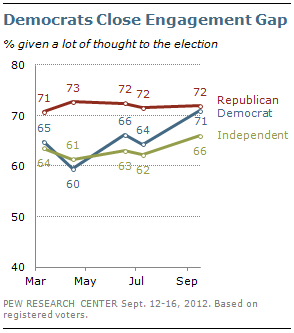 But the focus on economic issues may benefit Romney among swing voters. Roughly one-in-five voters (22%) are not fully committed to a candidate at this point in the race, and Romney leads Obama by significant margins among these voters as better able to improve the job situation and balance the budget deficit. Confidence in Obama’s economic stewardship is down significantly since shortly before he took office, but has stabilized in recent years. In January 2009, just prior to his inauguration, fully 75% of voters said they had confidence in Obama to do the right things to fix the economy. After a controversial stimulus plan, heated debate over health care reform and persistently high unemployment, that percentage fell to 51% in December 2009. The current measure shows little change. Other personal evaluations of Obama show a similar trajectory. The percentage of voters saying Obama makes them feel “hopeful” fell precipitously during the first year of his presidency (from 69% just after his election to 52% in March 2010), but has slipped no further in the three years since (50% in the current survey). Nearly two-thirds (64%) continue to describe Obama as “inspiring,” down from a high of 81% in the days after he was elected, but about the same as in early 2010 (59%). The survey finds that overall patterns of voter support for Obama and Romney have changed little over the course of the campaign. 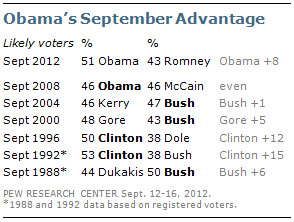 Obama holds a 56% to 37% lead among women registered voters, but only runs about even among men (47% Romney, 46% Obama). 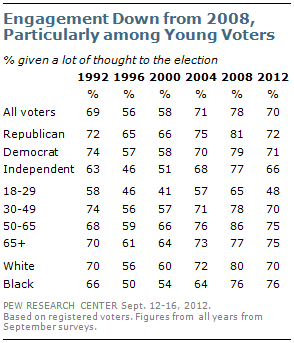 Voters younger than 30 continue to support Obama by a wide margin (59% to 33%). Voters 30 to 49 favor Obama by a 52% to 41% margin; older voters are more evenly divided. Romney draws broad support from white evangelical Protestants. Race and ethnicity remain key correlates of candidate support: 92% of black voters support Obama, as do 69% of Latinos, compared with 43% of white non-Hispanics. Among whites, Romney runs better among white men and white working class voters than among women and white college graduates. These patterns broadly parallel racial divides in the 2008 vote. And in that regard, a special analysis of the survey finds that racially conservative attitudes play no greater role in opposition to Obama than they did in 2008.